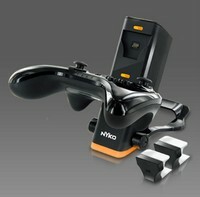 Nyko has a cool charging unit for the Nintendo Wii U Pro Controllers. The Charge Base Pro can charge two of the controllers at the same time. There are four main pieces to this unit. The first is the power cord. Next we have the main unit with its base. The next two pieces magnetically connect to the unit, and connect to the controllers. The Charge Base Pro does not work with the Pro Commander for the Wii U. Which is a shame. But the differences between Nintendo's controller and Nyko's controller are the reason. I was able to charge a Pro Commander for the Wii U but it was not stable. Charge Base Pro does not take long to charge the Nintendo Wii U Pro Controller. Which will mean your family can get back into the game quicker. The charge last the normal length after using the Charge Base Pro. I have not found any degradation in terms of battery life. Charge Base Pro includes a sleek black look to it with gray trimmings. The lights are bold against the black background. The stand on the backside put the Charge Base Pro at a nice angle. This unit is also petite and will not take up much table space. The power cord is long enough to make it viable in multiple places in the house. The Charge Base Pro can also be used for storage. It can easily house two controllers when you are done playing with them. The magnetism in Charge Base Pro is really cool. I read about it but did not completely understand it until I used it on this charger unit. Please click on one of these picture(s) to purchase this game and support us. Family Friendly Gaming is given a 4-5% commission on all orders.